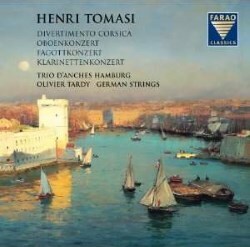 I’m always eager to discover something new and Rob Barnett's enthusiastic reviews of recordings of works by Henri Tomasi aroused my curiosity in a composer I was not at all familiar with (review ~ review ~ review ~ review). These performances on a Farao Classics CD, although released in 2010, are of such high quality that I felt they badly needed a review to help reawaken interest. The album was issued to commemorate the composer’s 110th birthday and the 40th anniversary of his death. World War II marked a turning point in Henri Tomasi’s fortunes. He began to achieve international recognition, when previously his reputation had been confined to his native France. He had won the Grand Prix de Rome in 1927, and early works such as Cyrnos, Vocero and Tam Tam had consolidated a home-grown interest. Now he became one of the foremost French composers of his day. He was drawn especially towards opera, and composed twelve in all between 1941-1971. Yet, instrumental music also seemed to stir a passion. His twenty concertos were written for some of the most eminent soloists around at the time, names such as Zino Francescatti, André Navarra, Devy Erlih and Maurice André. Tomasi’s music has plenty of appeal and has proved popular with performers. He himself stated that it embraced the most modern forms of expression, but at its heart is a lavish lyricism and profuse melodic generosity. His desire was to write music that emanated from the heart. This certainly characterizes what we have here, dating from the beginning of the fifties to the early sixties. In his later compositions a more developed musical language is at play, where minimalism and atonality are explored, but always in the context of a lyrical and melodic narrative. The Divertimento Corsica is the earliest work here, dating from 1952. The composer recalls fond memories of summers spent with his grandmother in Corsica. The four movement score harnesses Corsican folk melodies and dances, depicting happy times past, and aspects of life on the Mediterranean island. There’s some delicious woodwind scoring throughout, adding an array of tonal colour and allure to the piece. Oliver Tardy draws abundant enthusiasm from the players, and they sound as though they’re enjoying themselves to the full and have a real love for the music. Unlike the three-movement clarinet and bassoon concertos which were commissioned by the Paris Conservatoire to serve as audition pieces, the oboe concerto is in one movement. Composed in 1959, it’s a scaling down and condensing of his ballet Jabadao, a score he was working on at the time, into a 17 minute concerto. It’s based on an André Boll text. A group of young maidens who have stolen away from a Day of Atonement procession, dance the night away to a satanic ritual. At daybreak they incur the wrath of God and turn to stone. With the solo oboe being the protagonist, the composer felt it apt to title the work a concerto. Nicolas Thiébaud’s intelligent musicianship is a positive asset. The Bassoon Concerto received its premiere on April 19, 1961 at the Société Nationale de Musique with bassoonist Maurice Allard. It demands a high degree of virtuosity from the player, with rapid tonguing and wide leaps offering a complex challenge. Christian Kunert’s stunning virtuosity is impressive and his clean articulation is admirable. The second movement, despite its rather misleading title ‘Sérénade nocturne’, is jazzy and whimsical. The finale incorporates a saltarello, yet another reference to Tomasi’s Corsican connection. In the Clarinet Concerto the soloist is pitched against a strings-only ensemble. The concerto bears a dedication to Ulysse Delécluse (1907-1995), a French Clarinettist. Two spirited outer movements frame a central Nocturne, in which the soloist weaves his poetic line against a diaphanous orchestration. The effect is both other-worldly and spectral. The Scherzo finale cannot fail to lift the spirits with its geniality, yet the middle section digresses with a short contrasting passage of reflective pathos. Rupert Wachter captures the work’s essence to perfection. These accomplished performances have been well-recorded, with sound quality being top of the range. The venue of the Church of Saint-Amant-Roche-Savine fulfils its role perfectly in offering a sympathetic acoustic to showcase these admirable scores.